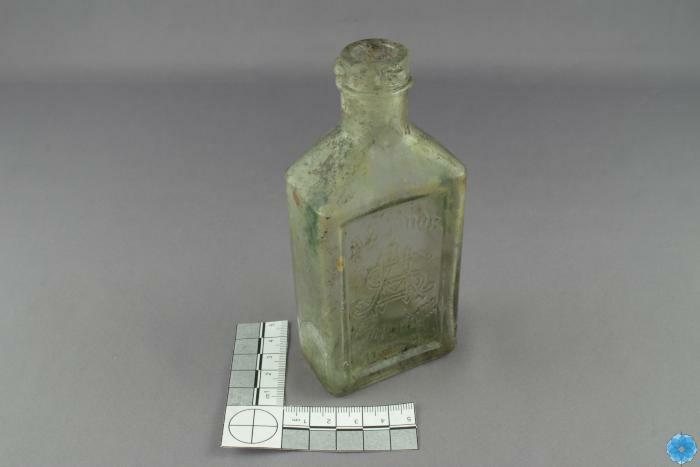 Marks/Label: Embossed lettering on the front is "A.S. Hinds Portland ME U.S.A."
Description: Medium sized glass bottle with random patches of brown, black, and green surface staining inside and out. Front is indented with company name, symbol, and location in embossed lettering. Back is not indented but smooth and flush. Has an "Owen machine mark" on the bottom. History of Use: A.S. Hinds Company was based in New England (Portland, ME) as a maker of medicines for coughs and colds.